Please click on the images below to link to and learn about exciting activities and innovations around disability, both locally and internationally. The goal of AIM is to reframe disability and focus on the ability of all individuals. We strive to facilitate a perceptual shift allowing employers to see the value in attracting, hiring, retaining and promoting individuals with disabilities. BC Adaptive Snowsports supports and promotes the sport of adapted skiing and snowboarding as a form of recreation and rehabilitation for all participants, contributing to an overall active and healthy lifestyle for British Columbians. From cells to community: ICORD research is anything from cellular to community level research that addresses a question concerning the promotion of improved functional outcomes and quality of life for people with spinal cord injury. The Rick Hansen Institute is a collaboration of people with spinal cord injuries, researchers and service providers committed to addressing priority needs and generating solutions for people with SCI. 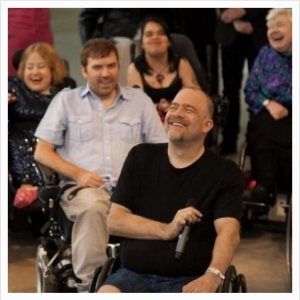 Vancouver Adapted Music Society works with musicians of all levels of ability, providing entry-level music making, along with a CD-quality recording studio at GF Strong Rehab Centre, Vancouver. Programs: karaoke – music workshops – concerts – studio & practice facility. Tetra Society of North America provides volunteer engineers to design and construct customized assistive devices for people with physical disabilities. Volunteers work one-on-one with people with specific needs that cannot be met by commercial assistive devices. The ConnecTra Society works as a connecting agency linking its members to programs offering education, recreation and work opportunities specifically for persons with physical disabilities. Programs: workshops – presentations – outreach – information centre. We would like to acknowledge GF Strong, especially recognizing Darryl Caves, Dominic Geraldes, Jeff-Macdonald-Bain, and Patrick O’Brien for the design and build of James Sanders’ brace for the production Skydive. SCI-BC helps people with physical disabilities achieve goals, regain independence and move forward with their lives; improving the quality of life of all British Columbians. 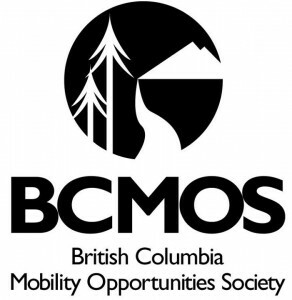 BC Mobility Opportunities Society provides opportunities for people with physical disabilities to explore the outdoors, centered around a specially designed, single-wheel, remote access wheelchair. Programs: day hikes – theme hikes – year-round TrailRider rentals – gliding. 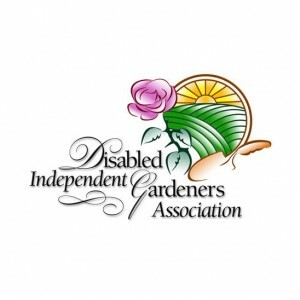 Disabled Independent Gardeners Association provides people with significant physical disabilities the opportunity to become involved in gardening. Programs: workshops – one-on-one volunteer gardening help – accessible gardens. Disabled Sailing Association of British Columbia promotes freedom and independence by providing people with disabilities the opportunity to actively participate in an exciting and challenging outdoor sport, using a specially designed adaptive sailboat. Programs: recreational sailing (novice to expert) – regattas. The Canadian Wheelchair Sports Association (CWSA), founded in 1967, is a national sport organization representing wheelchair athletes. It is an incorporated, not-for-profit, organization recognized by Sport Canada. C.B.I. Consultants has been providing person and family centered consultation to children, youth and adults with complex support needs since 1990. C.B.I Consultants is committed to achieving diversity and inclusion for persons with disabilities through innovation and excellence. We help people with disabilities find employment and to help create a diverse and inclusive workplace. Open Door Group has provided employment programs to persons with disabilities for over 35 years. We operate on the fundamental belief that all British Columbians have the ability to succeed. Services include individualized employment counselling, pre-employment and job search workshops, employer contacts and on-going support. Contact us for more information! The N eil Squire Society is a Canadian non-profit organization whose purpose is to create opportunities for independence for individuals who have physical disabilities. Through direct interaction with these individuals, the Society researches, develops, and delivers appropriate, innovative services and technology to meet their needs. Triumph Vocational Services creates opportunities for people with disabilities in British Columbia to develop skills, increase independence and participate in the workplace. EASE supports the safe exploration and expression of sexuality and other intimate connections for persons with disabilities. The People with Disabilities section provides information and statistics on the Canadian population.